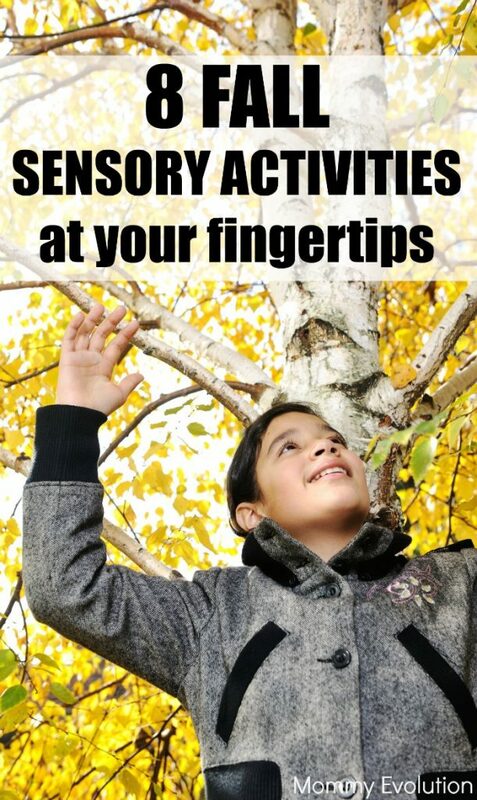 Fall is an amazing time of year for your child to explore her sensory world outside. 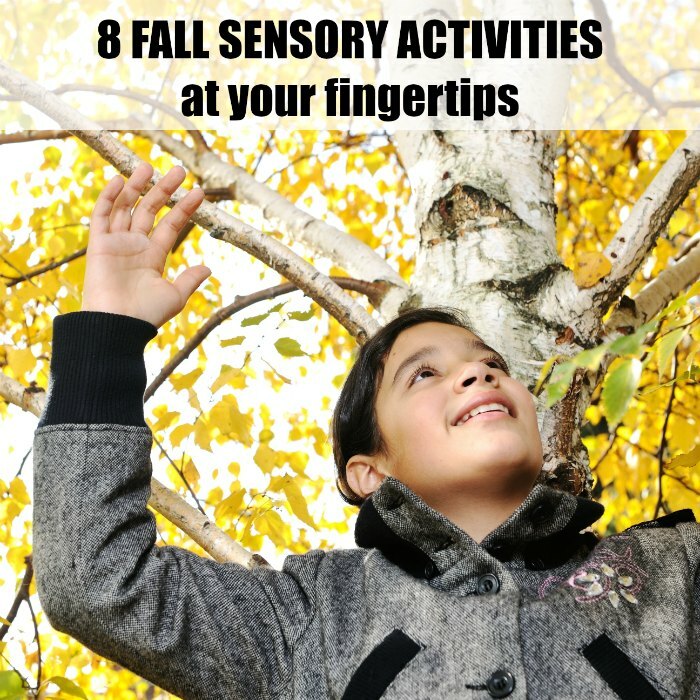 Try these eight fall sensory activities that are just sitting at your fingertips. Now that school is underway, many of our kids are stuck inside sitting at desks. Get those children outdoors to burn off some energy, get sensory input and regulate those little bodies! 1. Rake Leaves. Raking leaves is a terrific way to get in some heavy muscle work while having fun. 2. Jump in the pile. Nature has provided you your own “ball pit” so take advantage of it. Jump into the pile of leaves. Throw them up in the air. Let the sensation of the leaves envelope you. 3. Listen to the leaves. Step onto the dried leaves. Do they make a crunching noise? What if we crumple them in our hands? How do they feel? Talk about what you hear and touch. 4. Play hide and seek. Use that pile of leaves you just made to hide objects. Take everyday household items and stash them in the pile. Your child will have a ball trying to find them in the mix. If your kids are older, make the game a little harder by having them find the objects with their eyes closed. 5. Create crafts with found objects. With the fall comes a host of new items to create with. From dried leaves to acorns, take advantage of what nature has to offer. Need some ideas, visit my Fall Craft Board or The Sensory Spectrum’s Sensory Activity Pinterest Board. 6. Go on a nature scavenger hunt. Get some kitchen tongs or tweezers out and let your little one explore the world outside. She’ll have fun searching for small items to pick up while working on her grip strength. 7. Carve a pumpkin. Carving pumpkins has so many sensory outlets! Carving offers fine motor practice while scooping out the goop gives your child a tactile sensory smorgasbord. 8. Take a hike. Find a nature trail and follow it. Keep your eyes open for things you may spot like birds and squirrels. She won’t even know she’s getting a good workout. « What are the Signs of ADHD in Children? Leaves used to be so much fun before we had to clean them up. Now they’re a chore! I like to see my kids enjoying them though. Thanks for the post! Shared on twitter! My kids are definitely leaf jumpers too. But once in a while they surprise me. Those are such wonderful ideas! The fall can be such a beautiful season. Thank you for dropping by my linky party. Have a great week! Fall is my favorite time of year. I looks forward to sharing these activities with my daughter this year. There are so many things I love about this post! I love activities that are simple and free. There’s something so beautiful about that. I promised my son we would go on a Fall Adventure this afternoon to collect some “decorations” for our mantle. Now, after reading your post, I’m even more excited! Thanks! PS Following you now on Bloglovin, Facebook, Instagram, and Pinterest. Can’t help myself! LOTS of fun fall activities! We LOVE fall at our house – favorite season for sure!